WASHINGTON — When a Wisconsin man opened fire inside a suburban Milwaukee spa in 2012, he used a handgun he bought only a day before from a seller he found online. Radcliffe Haughton killed four people, then turned the gun on himself. But if he had tried to get that gun from a licensed dealer, the sale likely would have been blocked. He was legally disqualified from owning a firearm because he was subject to a restraining order for abusing his wife, Zina, who became one of his shooting victims. "Had there been a background check done, chances are she'd still be with us today," says her brother, Elvin Daniel. "If we can prevent one family from going through what we went through, I think that would be a tremendous help." He supports a bill before the House Judiciary Committee on Wednesday that would require background checks on nearly all private sales. Advocates say it would close off a source of guns used by criminals. But opponents say universal background checks are unnecessary and ineffective. State laws vary, but under current federal law licensed dealers such as sporting goods stores must conduct background checks to find out if buyers are legally qualified to purchase a firearm and do not, for example, have a felony record or domestic violence conviction. Private sellers at gun shows or across the backyard fence, on the other hand, are not required to check a potential buyer's background. Internet sites such as Armslist.com make it easy to find a nearby seller. Everytown For Gun Safety, which supports the House bill, says the site posted 1.2 million ads last year where no background check was required. The gun control group hired private investigators who shopped for guns online then recorded hidden camera videos when they met the sellers to buy guns with cash. One seller on the video, joking about the lack of a background check, said, "I'm assuming that you haven't beaten your wife lately, done any drugs, you're an Ohio resident." To the group's president, John Feinblatt, "It's a little bit like if you went to the airport today and there were two lines, one where you had to go through screening by TSA and the other where you could just waltz through." But opponents of universal background checks say they're ineffective and would complicate transactions for legitimate buyers and sellers. 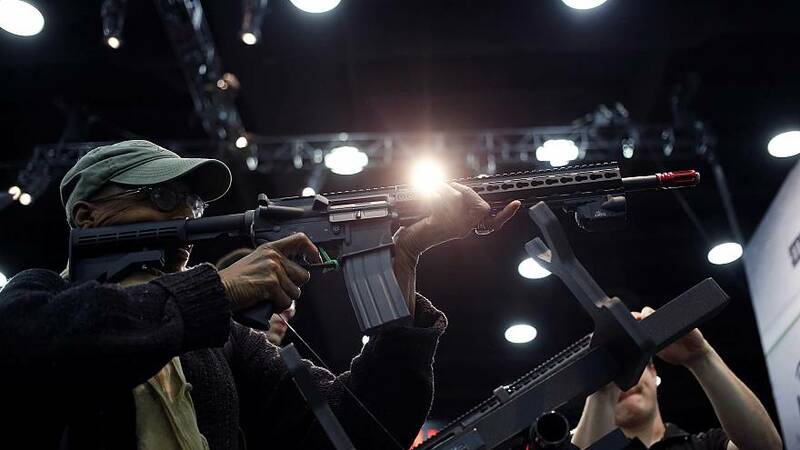 "So-called universal background checks will never be universal because criminals do not comply with the law," says Jennifer Baker of the National Rifle Association. She notes that a 2016 Justice Department survey of state and federal prisoners found that 90 percent of them said they stole their guns or bought them on the black market, not from legitimate sellers like those on web sites. Fewer than one percent got their firearms at a gun show. Jon Gibbon, co-founder of Armslist.com, points out that his website does not sell guns. "We merely allow individuals to talk about this vital civil right because so many web companies have chosen to disenfranchise an entire segment of our population," he said. Gibbon advocates allowing open access to the federal gun background check system, saying, "Everyone should be able to easily find important background information on a person with whom they intend to do any type of business." Democrats have tried for 20 years to expand background checks beyond licensed dealers. They may now have the votes in the House, but with opposition from advocates of gun rights, its prospects are doubtful in the Senate. Elvin Daniel says he hopes the law is changed. "I'm a gun owner, NRA member, and hunter. Every gun I buy, I go through a background check. Pretty simple, really."